Been going through computer files and see I've got some leftovers from previous posts. So, to begin with, Allen Heath. A legend. The top photo connects with Pike Green's story about Allen getting "some air" at Portland back in 1947. Below is an old business card for a shop Allen had in southern California. 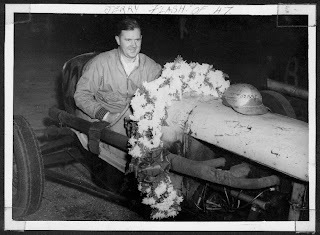 Allen won races down there from the 1940s to the 1960s in both midgets and sprint cars. 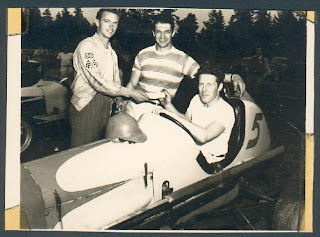 Back at this post there is a comment about motorcycle racing in Chilliwack from Rod Hudson. 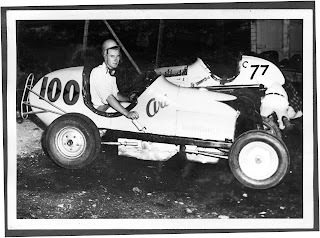 His father, Vic, was an oldtime Westwood racer, as well as all the things described at the aforementioned link. Here's a Chilliwack Progress story on Vic Hudson from 1973. "Goggles Pizano", Fred Flinstone's alter-ego in one episode of The Flintstones. The weather has definitely sucked for the past week or so. Rain and wind. Motorcycle scrambling weather? Maybe. Maybe not. Another game show from 50 years ago. Art Lane in the No. 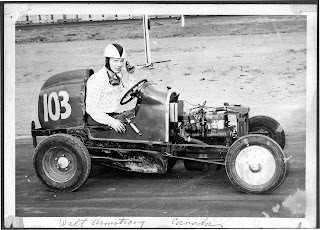 100 and Walt Armstrong in the No. 103. Circa 1946. The C77 is probably Gordon Reelie's machine. 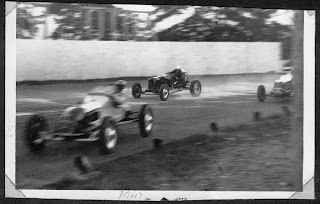 From a disc of northwest midget racing photos sent to me by Chuck Harring that he made of Ione Rentz' collection. Her husband, Frank, owned various cars over the years. The headline reads "lustreless meet" but I do like the winning wreath. And the kiss. 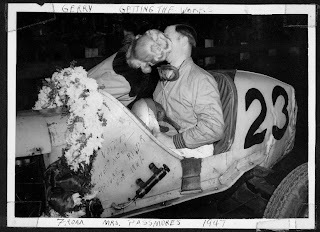 Jerry "Jeep" Vantreight at Langford Speedway. A couple more photos from Langford Speedway. These actually come from the web at this site. Pike Green, one of the inspirations for this blog. I've been looking at my Victoria stuff. Langford Speedway. So a few posts of that track. It operated from 1936 to 1941 and again from 1946 to 1950. 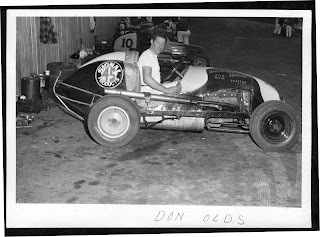 Don Olds did very well at Langford in 1948. He won five main events and set, and reset, the track record down to 17.50 seconds. 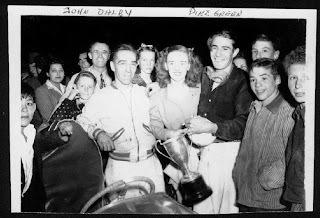 He also won a couple main events in the midgets at Digney Speedway that year. A couple "old racers" on a game show in 1961. I don't know much about it. Allan Brown's History of America's Speedways says it ran from "c.1956 to c.1960". The ad I have comes from 1960. This link is for what is thought to be some 1960 colour photos from Bayview. If not, they are still really cool to look at. Karen Hall, who was at the Westwood50 celebrations last summer, made headlines being the first woman to win an overall class award in the SCCBC.